I’m sorry to announce the passing of one of the most genial and generous people in the Hartley community. Chris Bird passed away at 3 pm on Monday 8th April, 2013, aged 84. Our sincere sympathy goes out to his sister, Mary, his niece, Janice, his nephew, Trevor, and his long term friend and companion, Pam. I’m sure there are many more words to be written about this gentle man who was never short of words, but this is not the time. A funeral service will be held for Chris at St John’s Anglican Church in Hartley on Friday, 12th April at 12 noon. Meanwhile, a photographic tribute to Chris from the last 14 years of his life. A Page on this website has just been set up to honour Chris Bird’s memory. It can be viewed here. Should anyone wish to contribute memories or stories of Chris to add to this page, they can be added to the comments section at the bottom of Chris’ page or posted to the HDPA Post Office Box 372 , Lithgow, 2790. A friend in need a friend indeed. Nothing was ever too much trouble for Chris, he would never let you down, a fine gentleman and friend who we will never forget. 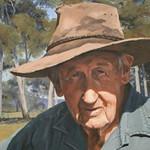 He had so many stories to tell, and he tell he did:) He would turn off the ignition of his old ute, push his hat back on his head and cross his arms and you would know another long tale would be told. God bless and keep you Chris. I comletely agree with Tom and Joan. Another gap never to be refilled. We are all the poorer for Chris’ passing but all the richer for having had the priviledge of knowing him. Vale Chris Bird, Nature’s gentleman.